*VIP: show the current level of VIP. Click it to get in the interface of VIP privilege. *Diamonds: Mainly obtained by recharging. The major function is to buy properties, attempts, and so on in the game. *Gold: Mainly Obtained by systems like Main Story, Dungeon, Quest, and so on. The major function of Gold is to rank up and enhance equipment and Relic. *Stamina: Mainly obtained by buying with diamonds and ranking up. The major function of Stamina is for the consumption of Main Story Dungeon and Elite Dungeon. *Show daily events, game recharges, and settings: show/hide, mails, rankings, maps, etc. *Guild players to various Dungeons. *Show Game Systems: Mount, Equipment, Recycle, Quest, Squad, Heros, Relics, and Mall. *Players can input words in this panel, and send them by tabbing the enter. This panel shows players chats. 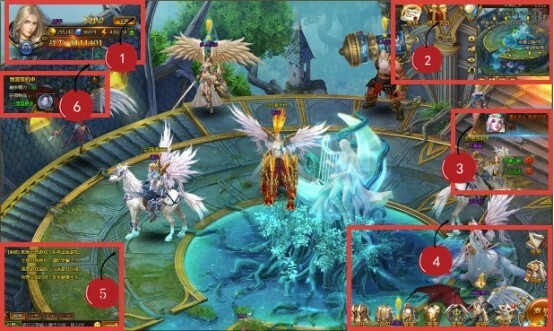 *Show the current condition of Palace Dungeon, including rewards and bonus.